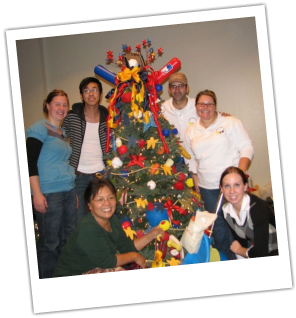 Synopsis: Resident Steven Smith worked with children and youth from the Rancho Cordova Youth Advisory Council (RCYAC) to explore the spirit of giving during the 2008 holiday season, by participating in Sacramento's 2nd Annual "Festival of Trees" event. The Festival of Trees is an annual celebration that happens in cities all over the United States. Community groups and businesses "adopt" holiday trees and deocorate them with a variety of ornaments, gifts and other items, and then auction them off, donating proceeds to local charities. The Sacramento Festival proceeds go toward the Cathedral Square Homeless Program. Dr. Steven began his project by talking with members of the RCYAC about the Festival of Trees celebration, and the organization it benefits. He used this opportunity to open a wider discussion around civic engagment and community service, and how they actually help improve the health of communities. Then the fun began, when the youth started to design their tree with Dr. Steven. They chose to use a "gingerbread children" theme, cutting large gingerbread shapes from wood to stain and stand around the tree. The youth also wrote brief paragraphs about their future career aspirations, and helped raise funds to purchase gifts relative to those careers, that could be placed under the tree. See Dr. Steven's project planning worksheets, by clicking on the documents below.